Consign with Skinner in San Francisco | March 2015 | Skinner Inc.
Register online for an appointment on Saturday March 21st at The Hotel Drisco or schedule an individual house call March 19-24. 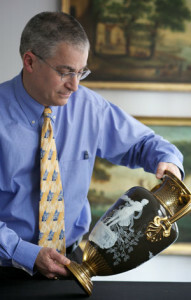 Stuart Slavid, Director of European Furniture & Decorative Arts, Fine Silver and Fine Ceramics, and Karen Keane, Chief Executive Officer and expert in Americana and Folk Art are currently scheduling consignment appointments in San Francisco on Saturday March 21. Register for an appointment online by Wednesday March 18. For appointment requests after March 18 or to schedule a private house call please contact Stuart Slavid directly. House calls are available on a limited basis. This entry was posted in Event and tagged American furniture, antiques, auction, ceramics, consign, consignment, decorative arts, european furniture, event, Fine Jewelry, folk art, free event, jewelry, silver by Skinner. Bookmark the permalink.